Sami Khedira (German pronunciation: [ˈsaːmiː xeˈdiːʁaː]; born 4 April 1987) is a German professional footballer who plays as a central midfielder for Juventus and the Germany national team. He began his career at VfB Stuttgart, winning the Bundesliga in 2007, before moving to Real Madrid in 2010. In his five seasons in Spain, he won seven domestic and international trophies, including the UEFA Champions League in 2014. In 2015, he moved to Italian side Juventus on a free transfer, and won the Serie A title and Coppa Italia in his first three seasons with the club. A full international for Germany since 2009, Khedira has earned over 75 caps for the national team. He has taken part at three FIFA World Cups and two UEFA European Championships with Germany, and was part of their squads which reached the semi-finals at the 2010 FIFA World Cup, as well as the 2012 and 2016 UEFA European Football Championships; he also won the 2014 FIFA World Cup. Before joining the youth team of VfB Stuttgart in 1995, he played at TV Oeffingen. In the first months of the 2006–07 season, he was called up into VfB's Bundesliga squad by manager Armin Veh. His debut followed on 1 October 2006 against Hertha BSC, replacing Antônio da Silva at the end of the 2–2 away draw. He scored his first two goals on 29 October in the 3–0 win against Schalke 04 at the Mercedes-Benz-Arena. On 29 January 2007 he signed his first professional contract at VfB, valid until June 2009. In the last game of the season on 19 May, Khedira scored the winner as Die Schwaben came from behind to defeat Energie Cottbus 2–1 and became champions for the first time in 15 years. On 9 July 2008, he extended his contract until the summer of 2011. In the ensuing season, he scored a career-best 7 league goals in 27 games, including both in a 2–2 draw against Bayern Munich on 13 December. Khedira running past Atlético Madrid's Arda Turan in the Madrid derby in September 2013. On 30 July 2010, Khedira moved to Real Madrid for an undisclosed fee, signing a contract until 2015. Khedira made his debut on 13 August in a friendly match against Bayern Munich, which Real Madrid won 4–2 on penalties for the Franz-Beckenbauer-Cup. His league debut came sixteen days later, in a 0–0 away draw against Mallorca. He made 40 appearances across his first season in Spain and won his first club honour on 20 April 2011 as his team won the Copa del Rey final against El Clásico rivals FC Barcelona. He scored his first competitive goal for Real Madrid in the Champions League, on 18 October 2011 against Olympique Lyonnais. He scored his first Copa del Rey goal against Málaga CF in a 3–2 home win when Real Madrid were trailing behind 0–2, and his first league goal against RCD Espanyol in a 5–0 home win. On 21 April 2012, Khedira scored his second league goal, against Barcelona; the goal was Real Madrid's 108th of the season in the league, breaking the previous La Liga record of 107, also set by them in the 1989–90 season. On 9 June 2015, Italian side Juventus announced that Khedira had signed a four-year deal on a free transfer. The move was completed on 1 July, at the start of the 2015–16 season. On 1 August, Khedira was stretchered off the pitch after just 25 minutes while playing in a pre-season friendly match against Marseille with a hamstring injury and was ruled out of the Supercoppa Italiana a week later against Lazio. Two days later Juventus confirmed that it was actually a muscle tear in his right thigh, and that he would be sidelined for approximately two months. He was called back to action on 30 September as he started in a Champions League group stage match in a 2–0 win over Sevilla. On 4 October, Khedira made his Serie A debut, starting and scoring the final goal of a 3–1 home win against Bologna in the 63rd minute. On 20 March 2016, Khedira scored his fourth goal of the league season in a 4–1 win at Torino in the Derby della Mole, but was given a straight red card for dissent later on. On 20 August 2016, Khedira opened the 2016–17 Serie A season with a goal in a 2–1 home win over Fiorentina. A week later he scored the only goal in a 1–0 away win over Lazio in the league. On 22 October 2017, Khedira scored his first career hat-trick in a 6–2 away win over Udinese. On 7 March 2018, Khedira made his 100th appearance for Juventus in a 2–1 win over Tottenham at Wembley Stadium, in the second leg of the round of 16 of the UEFA Champions League, assisting Gonzalo Higuaín's goal. In September 2018, Khedira signed a new contract with Juventus, which would keep him at the team until 2021. In February 2019 he was ruled out for a month to undergo treatment after it was diagnosed that he suffered from an irregular heartbeat. He returned to action on 6 April, coming as a substitute for his injured compatriot Emre Can in a 2–1 home win over Milan. 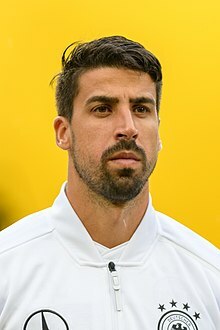 Khedira has appeared 30 times for several German youth national teams; he captained the under-21 side during the 2009 European Under-21 Championship, which Germany won, defeating England 4–0 in the final. Khedira made his debut for the senior national squad on 5 September 2009 in a friendly match against South Africa. He was substituted on in the 73rd minute for Simon Rolfes. Khedira was called up to the German squad for the 2010 World Cup in South Africa by coach Joachim Löw. Filling in for the injured Michael Ballack as a central midfielder, he played in all seven matches, and was only substituted twice, as Germany reached the semi-finals. After appearances in five friendlies prior to the World Cup, he made his first competitive appearance against Australia in Germany's first group game. On 10 July 2010, with his first senior international goal, he scored Germany's 16th and last goal of the tournament, in the third place match against Uruguay; Khedira's match-winning header, which came eight minutes from time, ensured the final 3–2 scoreline, and won the young German team the bronze medal. Khedira was in the starting lineup in eight qualification matches for Euro 2012, helping Germany top their qualifying group with a record ten wins out of ten matches. During the final tournament, he featured in every minute of their run to the semi-finals, scoring in the 4–2 quarter-final win over Greece at the PGE Arena Gdańsk, and was selected for the Team of the Tournament. Khedira playing against Bernard at the 2014 FIFA World Cup. Khedira tore his ACL in his right knee in a friendly match against Italy on 15 November 2013 and it was estimated that he would be ruled out for around six months, which put his participation at the 2014 FIFA World Cup into question. However, he recovered in time to be named in Germany's squad for the tournament, and was selected to start in the team's opening match, a 4–0 win against Portugal. On 8 July, he scored Germany's fifth goal in the 7–1 semi-final defeat of hosts Brazil. He was injured during the pre-match warmup for the Final against Argentina, and was replaced by Christoph Kramer in the team's starting line-up, as Germany eventually won 1–0 after extra time. Khedira was named to Joachim Löw's 23-man Germany squad for UEFA Euro 2016. On 2 July, he was forced off after sustaining an injury in the first half of the quarter-finals against Italy, and was ruled out for the remainder of the tournament; Germany won the match 6–5 in the resulting penalty shoot-out, following a 1–1 draw after extra-time. As in the previous edition of the tournament, Germany were once again eliminated in the semi-finals of the competition, following a 2–0 defeat to hosts France on 7 July. On 4 June 2018, Khedira was included in Joachim Löw's final 23-man squad for the 2018 FIFA World Cup. As Germany were eliminated in the group stage, Khedira was deemed as one of the weakest performers in the squad. After the tournament, he was left off the team for the subsequent UEFA Nations League matches. Khedira is considered a dynamic and well-rounded midfielder, with good awareness and "flawless aerial ability", who can cover a lot of ground efficiently, recover the ball and quickly join in the team's attacking plays; he is also capable of being a goal threat with his heading accuracy and powerful mid-range shooting. A physically strong, energetic, and tactically intelligent player, he is also known for his ball-winning abilities, work-rate, and vision, as well as his solid technique and reliable passing, which allow him to play anywhere in midfield; although usually a central midfielder, he has also been deployed as a defensive midfielder or as a box-to-box midfielder, due to his stamina, movement, positional sense, and versatility, which also enable him to create space or contribute to his team's offensive plays with goals, due to his ability to make late runs into the penalty area from behind. In spite of his playing ability, however, Khedira is also known to be injury-prone. Khedira was born in Stuttgart. His father is Tunisian and his mother is German. Sami's younger brother Rani plays for FC Augsburg and has represented the German U19 team. He is a Muslim. 1.^ Includes German Cup, Spanish Cup, and Italian Cup. 2.^ Includes, UEFA Champions League, UEFA Europa League/UEFA Cup, and UEFA Intertoto Cup. 3.^ Includes German League Cup, Spanish Super Cup, UEFA Super Cup and FIFA Club World Cup. Scores and results list Germany's goal tally first. ^ a b c "FIFA World Cup South Africa 2010: List of Players" (PDF). FIFA. 12 June 2010. p. 11. Retrieved 8 December 2013. ^ "Sami Khedira". juventus.com (in Italian). Retrieved 29 May 2017. ^ a b "Sami Khedira". Real Madrid C.F. Archived from the original on 23 February 2014. Retrieved 3 March 2012. ^ "Origins are Irrelevant in Football – Portrait of Sami Khedira". Qantara.de. 21 February 2009. Retrieved 19 August 2010. ^ "El Stuttgart se corona campeón alemán con su triunfo ante el Cottbus" [Stuttgart crown themselves German champions with their triumph against Cottbus] (in Spanish). Diario AS. 19 May 2007. Retrieved 20 March 2016. ^ "Khedira signs until 2011". VfB Stuttgart. 9 July 2008. Retrieved 9 July 2008. ^ "Rescata Stuttgart empate ante Bayern Munich" [Stuttgart rescue draw against Bayern Munich] (in Spanish). Televisa Deportes. 13 December 2008. Retrieved 20 March 2016. ^ "Terms agreed with Real Madrid". VfB Stuttgart. 30 July 2010. Retrieved 30 July 2010. ^ "Report: Mallorca v Real Madrid". ESPN Soccernet. 30 August 2010. Retrieved 30 August 2010. ^ Hayward, Ben (21 April 2012). "Real Madrid breaks all-time Liga goals record with Sami Khedira's Clasico strike against Barcelona". Goal.com. Retrieved 23 April 2012. ^ a b "Khedira signs for Juventus". juventus.com. 9 June 2015. Retrieved 9 June 2015. ^ "Juventus sign Sami Khedira from Real Madrid on free transfer". The Guardian. 9 June 2015. Retrieved 9 June 2015. ^ "Khedira hamstring strain". Football Italia. 1 August 2015. Retrieved 1 August 2015. ^ "Juventus midfielder Sami Khedira ruled out of Italian Super Cup". Eurosport. 1 August 2015. Retrieved 1 August 2015. ^ Gladwell, Ben (3 August 2015). "Juventus midfielder Sami Khedira out for two months with thigh injury". ESPN FC. Retrieved 3 August 2015. ^ "Sami Khedira impresses on debut as Juventus are too canny for Sevilla". The Guardian. 30 September 2015. Retrieved 5 October 2015. ^ "Juventus-Bologna: 3–1". BBC Sport. 4 October 2015. Retrieved 5 October 2015. ^ "Torino 1–4 Juventus". BBC Sport. 20 March 2016. Retrieved 20 March 2016. ^ "Juventus 2 – 1 Fiorentina". Football Italia. 20 August 2016. Retrieved 29 August 2016. ^ Rzouki, Mina (28 August 2016). "Khedira stars again as Juventus earn a hard-fought win at Lazio". ESPN FC. Retrieved 29 August 2016. ^ "Udinese crushed by 10-man Juve". Football Italia. 22 October 2017. ^ "Khedira: 'My first hat-trick!'". Football Italia. 22 October 2017. ^ Phil McNulty (7 March 2018). "Tottenham Hotspur 1–2 Juventus". BBC Sport. Retrieved 9 March 2018. ^ Luke Brown (8 March 2018). "Paulo Dybala and Gonzalo Higuain stun Tottenham to send Juventus into Champions League quarter-finals". The Independent. Retrieved 9 March 2018. ^ "Tottenham-Juve: Talking Points". Juventus F.C. 8 March 2018. Retrieved 11 March 2018. ^ "Sami Khedira: Juventus midfielder signs new contract at the club until 2021". BBC Sport. 12 September 2018. Retrieved 12 September 2018. ^ "Sami Khedira: Juventus midfielder ruled out because of irregular heartbeat". 19 February 2019 – via www.bbc.co.uk. ^ "Juventus' Khedira out for a month after treatment for irregular heartbeat". ESPN FC. 20 February 2019. Retrieved 4 March 2019. ^ Fabiana Della Valle (6 April 2019). "Juventus-Milan 2-1, Dybala e Kean ribaltano il gol di Piatek" (in Italian). La Gazzetta dello Sport. Retrieved 6 April 2019. ^ "Khedira completes comeback". ESPN Soccernet. 10 July 2010. Retrieved 14 July 2010. ^ "UEFA EURO 2012 Team of the Tournament". UEFA. 2 July 2012. Retrieved 9 June 2015. ^ "DFB confirms Sami Khedira blow". espnfc.com. 16 November 2013. Retrieved 16 November 2013. ^ "Germany World Cup 2014 squad". The Telegraph. 2 June 2014. Retrieved 22 June 2014. ^ "Germany 4–0 Portugal". BBC. 16 June 2014. Retrieved 22 June 2014. ^ "Brazil 1–7 Germany". BBC. 8 July 2014. Retrieved 9 July 2014. ^ "Khedira out of final, Kramer steps in". ESPN FC. 13 July 2014. Retrieved 5 October 2015. ^ "Germany-Argentina: 1–0". BBC Sport. 13 July 2014. Retrieved 5 October 2015. ^ "Germany – Squad". UEFA.com. Retrieved 11 July 2016. ^ Burke, Jason (7 July 2016). "Germany 0–2 France: Antoine Griezmann's double fires hosts into Euro 2016 final with Portugal". The Daily Telegraph. Retrieved 7 July 2016. ^ "Germany announce final World Cup squad, with Manuel Neuer, without Leroy Sané". Deutsche Welle. Retrieved 4 June 2018. ^ Schulze, Katrin (29 August 2018). "Für Sami Khedira reicht es nicht mehr" (in German). Der Tagesspiegel. Retrieved 26 December 2018. ^ Rzouki, Mina (26 October 2012). "The importance of being Sami Khedira". Football España. Retrieved 21 August 2016. ^ Sylla, Ogo (30 September 2015). "Khedira comes to Juventus' rescue". La Gazzetta dello Sport. Retrieved 21 August 2016. ^ "Khedira signs for Juve until 2019". Marca.com. 6 September 2015. Retrieved 22 August 2016. ^ Rzouki, Mina (30 September 2015). "Juventus excellent in Europe again thanks to Sami Khedira masterclass". ESPN FC. Retrieved 29 May 2017. ^ Adam Digby (23 February 2016). "Juventus vs Bayern Munich: Sami Khedira is proving the perfect complement for Claudio Marchisio and Paul Pogba". The Independent. Retrieved 6 June 2018. ^ Massimo Pavan (13 February 2016). "ALLEGRI GIOCA IL JOLLY?" (in Italian). www.tuttojuve.com. Retrieved 6 June 2018. ^ "Juventus €25m for Rafinha". Football Italia. 16 May 2017. Retrieved 31 October 2017. ^ "Deutsche Talente und ihre Alternativen" (in German). Kurier. Archived from the original on 19 June 2009. ^ "Augsburg angelt sich Rani Khedira". kicker.de (in German). 23 July 2017. Retrieved 23 July 2017. ^ "U 15-Junioren Team Nationalspieler Rani Khedira" (in German). Deutscher Fussball-Bund. Retrieved 19 August 2010. ^ "How hard is it to be a Muslim footballer during Ramadan?". BBC Three. 10 June 2016. Retrieved 4 April 2019. ^ a b c d e "S. Khedira". soccerway.com. Retrieved 17 July 2014. ^ "Khedira, Sami" (in German). kicker. Retrieved 22 March 2014. ^ a b "Khedira, Sami" (in German). kicker. Retrieved 22 March 2014. ^ "Sami Khedira" (in German). Fussballdaten.de. Retrieved 22 March 2014. ^ "Sami Khedira" (in German). Fussballdaten. Retrieved 22 March 2014. ^ a b c d e f g h i "Sami Khedira » Club matches". World Football. Retrieved 3 April 2016. ^ a b "Sami Khedira". NFT. Retrieved 15 September 2016. ^ "Sami Khedira" (in German). fussballdaten.de. Retrieved 17 July 2014. ^ "Der Traum ist wahr: Real gewinnt "La Décima"" (in German). kicker.de. 24 May 2014. Retrieved 17 July 2014. ^ Gartenschläger, Lars (6 June 2013). "Khedira, Özil, Neuer – Aufstieg der Euro-Helden" (in German). welt.de. Retrieved 17 July 2014. ^ "Khedira mit Verdienstorden geehrt" (in German). sport1.de. 31 July 2016. Retrieved 3 August 2016. ^ "Ten Spain players in Team of the Tournament". UEFA.com. Retrieved 5 October 2016. 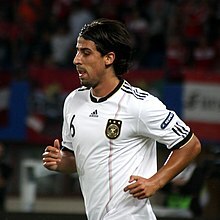 Wikimedia Commons has media related to Sami Khedira.